A creative installation that has morphed our Lambeth brick slips beyond recognition. TGI Fridays has been established since 1965 and is a world renowned restaurant franchise. The restaurant is famed for its casual dining, elaborate drinks and retro antique-filled decor. Fridays has seen its UK portfolio grow rapidly over that last few years. A distant throw from Telford, TGI Fridays began life in the 1970s on the Upper East Side NY, when the company began to franchise. The history and retro beginning of TGI would prove to be a major keystone in the design of all the chains outlets, including the Telford Restaurant. Brick wall tiles are a common feature in most of the TGI Friday outlets and the use of our fantastic Lambeth Mixture brick slips as a core product for this build has definitely paid off. So you find yourself sitting at a T.G.I. Friday’s table, eating Jack Daniels Ribs and slurping down a frozen strawberry Daiquiri, you look up and notice a drum kit suspended above your head illuminating the room. If the drum kit doesn’t cause you to pause chowing down Telfords finest buffalo ribs then a glance round the room might. 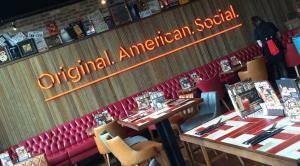 The design of TGI Telford like most of the chain deliberately aims to grab the diner’s attention. This installation has been executed with finesse and has incorporated the Lambeth brick slips with a stunning vigour, making a triumphant bold statement. The brick wall tiles form a stunning feature which acts as the back bone of the entire installation. The idea, when TGI Friday’s first began franchising was to make the restaurants look similar to an English pub, where items have slowly accumulated over decades. The use of brick slips throughout the build has created a flawless aged patina which transcends across the whole room. A giant 50ft wall exhibits a bold white wash logo which utilises the brick slips stable and strong surface as a terrific worn canvass. The designers of Fridays Telford have successfully created a warm relaxing venue which has all the comforts we come to expect from the upmarket chain which pride them selves on the full Americana Experience. Neon lights and glistening glassware flourish the brickwork with a transient palette of lights and shades. Checkerboard floors, chrome clad motorcycles, NBA Basketball hoops and disco mirror balls unite in harmony within this flamboyant design. Using brick wall tiles within restaurant refits are now common place and whether its stretcher bond, English bond or herringbone no matter how these stunning tiles are installed they instantly grab your attention. I am sure anyone reading this blog will agree that the Lambeth Mixture brick slip was a perfect choice against the chaos of the room’s décor. The Lambeth brick slip is a special mixture which incorporates red and yellow clay bricks in a blend which is meant to emulate the reconstructive materials that were used in post war London. The Lambeth mixture has a history and a character and most of all the Lambeth mixture has the ability to morph and blend when worked with in various installation methods. The installation of these brick tiles has been worked in with great artistry. The brick wall tiles, post installation have been flash pointed and brushed giving a “look what we have revealed” Look. The large mortar marks have been made using the Light grey pointing mortar and were deliberately made to look messy, afterwards wire brushed giving the reclaimed brick look. A white wash mix was used to paint the large FRIDAY text, highlighted with black outline this holds a real authentic note which rings through the installation. Buttresses and corners meant that a plentiful supply of Lambeth corners was used throughout the installation giving a convincing brick wall look throughout. The brick slips were installed using our rapid setting adhesive which is the perfect wall tile adhesive for installations of this scale. We take pride in the fact that every component of of our brick cladding system works harmoniously with each of its counterparts. The wall tile adhesive we supplied is the best adhesive available for this particular product and has been extensively tested for its application and safety. Taking inspiration from its roots and an interior that honours the foundations of its beginnings the Brick slip clad Brickwork forms a crucial component of this fantastic design scheme. With TGI Fridays grasp of the American diner market growing ever stronger, using our products to help achieve their signature look is something which we are extremely proud of. So whilst out and about in Telford don’t forget to call into TGI Friday and take a look at our fantastic Lambeth brick slips. Have a steak too whilst you are there, they are Yummy!